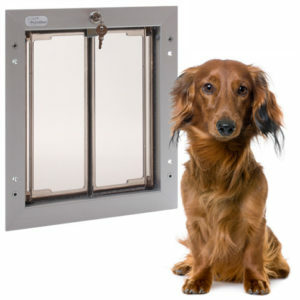 Both models have a saloon-style design, a cylinder lock with key, and they are delivered with a metal security plate that screws to the frame on the inside of the door. The doors are available for installation through a house door, through a wall, or as a glass kit. The aluminum frame is available in white, bronze, or brushed aluminum.